where c is the O2 concentration in the gas and c^2 is the O2 concentration at the border gas/liquid at equilibrium. • The solubility of CO2 in water is much higher than that of O2. • The soluted CO2L reacts rapidly with water, forming carbonic acid. For aH2co3,z = aHCo5 = 0.5 and for aHCo5 = aCO|- = 0.5, the pH values are called pK and pK2, showing characteristic values (pK = 6.33; pK2 = 10.33). • At pH < 4.5, all dissolved carbon is in the form of H2CO3Z « CO2. • At 4.3 < pH < 8.3, H2CO3,z « CO2 and HCO- dominates. • At 8.3 < pH < 12.3, HCO- and COf- dominate. • At pH > 12.3, all dissolved carbon is in the form of CO2-. This equilibrium can be influenced by temperature and the concentration of other anions. Fig. 4.2 Normalized concentrations a of the dissociation products of "carbonic acid" H2CO3X, HCO- and COf- as a function of pH (Nazaroff and Alvarez-Cohen 2001); T = 20°C. An industrial wastewater is polluted mostly by polysaccharides (CnH2nOn or for n=1CH2O, respectively). The composition of the bacteria is given by C5H7O2N. The flow rate is 10000 m3 d-1, the concentration of the influent is S0 = 2000 mg L-1 DOC; and 90% removal should be achieved. Calculate the amount of nitrogen which must be added. How much sludge must be treated? The specific growth rate p is large compared to the decay coefficient kd. In Section 4.2.1, YN/SC = 0.067 mol N (mol DOC)-1 and YXC/SC=1/3 mol C (mol DOC)-1 was calculated for aerobic degradation of hydrocarbons. rMLVSSV — 2 rXC V; 12 t MLVSS d-1 sludge must be treated. produced as CO2 in the air leaving the reactor and produced as CO2, HCO- and CO2- in the water leaving the reactor. Behrendt, J. 1994, Biologisch-chemische Behandlung von Prozesswässern der Altlastensanierung sowie von kontaminierten Grundwässern, VDI-Forschungs-berichte, Reihe 15, Umwelttechnik 119. Heinze, L. 1997, Mikrobiologischer Abbau von 4-Nitrophenol, 2,4-Dinitrophenol und 2,4-Dinitrotoluol in synthetischen Abwässern, VDI-Forschungsberichte, Reihe 15, Umwelttechnik 167. Herbert, D. 1958, Some principles of continuous culture, in: Recent Progress in Microbiology, ed. Tunevall, G., Almqvist, Stockholm, p. 381-396. Lax, E. 1967, Taschenbuch für Chemiker und Physiker, Springer-Verlag, Berlin. Nazaroff, W.W.; Alvarez-Cohen, L. 2001, Environmental Engineering Science, John Wiley & Sons, New York, 96, 114.
where K = 1.380 10-23 J K-1 (Boltzmann's constant), T is the temperature (K), wO2 is the rate of diffusion of oxygen molecules (mol m h-1) and FO2 is the power of resistance of oxygen molecules (J mol m-1). where r is the dynamic viscosity of water (g m-1 h-1) and RO2 is the molecular radius of O2 (m). 1 Only for very low reaction rates is it not dependent on oxygen mass transfer. Equation (5.6) is called the Henry absorption equilibrium (Henry's law, see Eq. 4.46) and is valid up to oxygen pressures of nearly p = 10 bar (c = p/RT). H decreases with increasing temperature and concentration of chlorides (Table 5.1). For 20 °C and deionized water H = 32.6 which means that, for an O2 concentration in air of 298.7 mg L-1, only 9.17 mg O2 L-1 are dissolved in water. Therefore, oxygen transfer into water by diffusion is a slow process, due to the low diffusion coefficient and the low solubility (Fig. 5.1). If we want to use oxygen for a chemical or biological process in water, we must: (a) use convection in addition to diffusion and (b) increase the gas/liquid interfacial area. Furthermore, it may be necessary to use pure oxygen instead of air in some cases, resulting in a higher dissolved oxygen concentration at the boundary c* by a factor of 4.8. But in our further discussion we will only consider the use of air. Fig. 5.1 Transport of oxygen from air into water only by diffusion. Table 5.1 Dissolved oxygen concentration in water c' for different temperatures and chloride concentrations; c = 20.9% O2 in air; pair = 760 bar (Chow et al. 1972). • We can produce small air bubbles, which rise to the surface of the water, causing an oxygen transfer into the water and to the suspended microorganisms. • We can produce trickling films, which flow downwards at the surface of solids covered by biofilms. In this chapter we will concentrate only on the transfer of oxygen from bubbles to water by diffusion and convection. In contrast to Fig. 5.1, where mass is only transferred by molecular motion (diffusion), we now want to augment it with convective motion (Fig. 5.2). and 8 is the thickness of the boundary (see Fig. 5.3). Fig. 5.2 Transport of oxygen from air into water by diffusion and convection. with kLa as the specific mass transfer coefficient. Especially in industrial wastewater, different components may be dissolved which may desorb during the absorption of oxygen. Because of their low Henry coefficient H, a transport resistance occurs in both phases, in water and air. This case will be discussed in the next section. Fig. 5.3 Absorption and desorption of compounds dissolved in water with a low Henry coefficient, H = c/c* = c0/c'0; (a) absorption, (b) desorption. (1923). We will limit our discussion to the two film theory. A review of all theories is given by Danckwerts (1970). Let us look at the mass transfer at the boundary water/air for desorption processes and for the case that two films are formed. 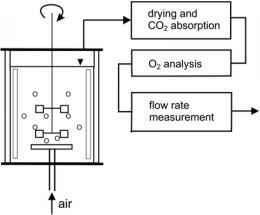 The desorption of oxygen into an oxygen-free gas film, e.g. nitrogen, is a simple case which follows nearly directly from Fig. 5.2. But such equilibria, which are characterized by a low Henry coefficient, lead to concentration profiles in both water and air for absorption (Fig. 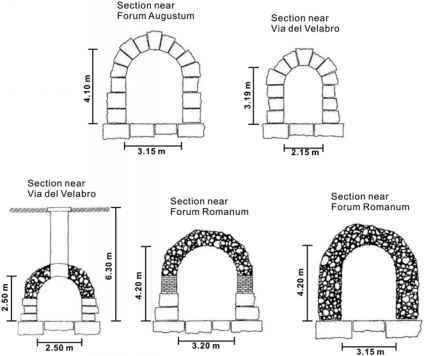 5.3a) and desorption (Fig. 5.3b). The rate of desorption must now be calculated using the two film theory. Table 5.2 compiles some compounds with low H.
Note that in Fig. 5.3b the concentration c in the air bubble is much lower than c*, the theoretical equilibrium concentration. • This simple equation is only applicable if we use c'- c* as the driving concentration difference to define the specific overall transfer coefficient KLa. • The resistance of the air film increases with decreasing Henry coefficient H, i.e. higher dissolution in water at lower concentration in air. • The influence of H is increased at low kGa and high kLa. Looking at Table 5.2 and assuming similar values for kGa and kLa, mass transfer resistance lies nearly completely on the air film side for compounds with low H (2-chlorophenol, methyl ethyl ketone, phenol and others) and nearly completely on the water film side for vinyl chloride with its very high H.
Although H = 32.6 (T = 20 °C) for oxygen/water (clean water) is relatively high (Section 5.1) and mass transfer is controlled for normal conditions by the resistance of the water film, we want to use the specific overall mass transfer coefficient KLa as well. The absorption of oxygen will first be discussed for a completely stirred tank reactor (CSTR) filled with clean water and equipped with a perforated annular tube below the stirrer (Fig. 5.4). Fig. 5.4 Installation for measuring the mass transfer coefficient in clean water or wastewater without activated sludge. Therefore, c' is zero until the dissolved SO|- is totally oxidized to SO42-. If we want to measure in nearly salt-free water after aeration, only a small amount of Na2SO3 should be added - just enough for a few experiments. The exhaust air with a low O2 concentration flows through absorption systems for drying and CO2 removal before entering on-line oxygen gas analyzers and flow rate measurement devices. c where V is the water volume, QG is the gas flow rate and co dissolved oxygen concentration. This relatively small simplification is only allowed for small decreases in the percent of oxygen volume inside the air bubbles, e.g. from 20.9 to 19.0%. For a greater decrease, a more complicated evaluation is necessary. Better results follow if a logarithmic mean value is used. Fig. 5.5 Non-steady state method for measuring the mass transfer coefficients in wastewater with activated sludge. tion. Period II is finished as soon as cmin;2 mg L—1 is reached. In the region of lower c' values, respiration rate may be limited by oxygen. Now aeration resumes and c' increases up to a constant value (period III). (KLa)w and (Kl a)w can be calculated. The experimental curve in period III is described in the best possible way obtaining a more exact value for (KLa)w. By comparing this value (KLa)w to KLa measured in clean water, both at 20°C, aw can be determined (see Eq. 5.12). Dissolved volatile organic components (VOC) can be divided into two groups, according to their Henry coefficient H (see Table 5.2). DVOC can be measured or calculated using Eq. (5.4). The exponent n is not easily obtainable and depends on the mixing equipment. For at least three different components with different Henry coefficients, H/KLa can be measured in the same mixing system at exactly the same conditions (stirrer speed, flow rate). A straight line must go through the date plotted as H/KL a versus H. The resulting value of kLa follows from the slope and ksa from the ordinate intercept. Only the results of a few studies are available (Libra 1993) to date. • OTR oxygenation transfer rate (ASCE 1997: Standard guidelines for in-process oxygen transfer testing). • OC oxygenation capacity (ATV 1997: Guidelines according to ATV Arbeitsblatt M 209). However, the air flow rate QG as well as the oxygen concentration of the escaping air is normally not measurable. Therefore, the only way to measure KLa is by using data obtained from absorption measurements and the balances for oxygen absorption described in Section 5.3.1.2 (see Eq. (5.27) for period II and Eq. (5.29) for period III). One problem must be noted: in Section 5.3 the reactors used for laboratory or pilot experiments have a small volume of several liters to 1-2 m3; and, regardless of the aeration method (volume or surface aeration), a nearly completely mixed gas and liquid phase cannot be guaranteed. Large-scale basins of several hundreds to several thousands of cubic meters cannot be completely mixed by surface aerators, such as centrifugal aerators. Therefore KLa as well as c' are different at several points of a "mixed" tank with one or more aerators. Nevertheless, the only way to obtain information about OTR in large-scale basins is to evaluate the measurements with Eq. (5.25) for clean water without sludge or Eqs. (5.27) and (5.29) for wastewater with sludge. • Use a fixed temperature (in Europe T = 20 °C). • Limit the maximum value for the difference of concentration. 1) Remember: Only for this definition of KL a, it is not influenced by concentration; see Eq. (5.20). Figure 5.6 shows a Simplex aerator. Different values of KLa can be selected via the rotation speed and depth of submersion. Frequently, a transmission makes three speeds possible. 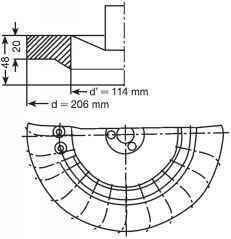 For a Simplex aerator with the dimensions presented in Fig. 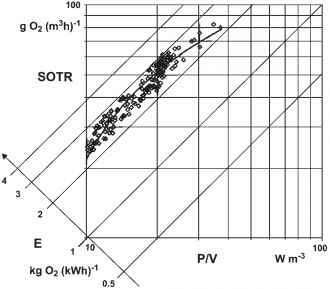 5.6, the standardized oxygen transfer rate (SOTR) is plotted versus power consumption P/V (see Fig. 5.7, in the next section). We will now consider a surface aerator and the power required to achieve a desired oxygen transfer rate. Fig. 5.6 Simplex aerator, number of blades = 24 (Zlokarnik 1979). Çm ' Çg where çm is the efficiency of the electric motor and çg is the efficiency of the transmission. and the values for e.g. Çm = 0.93 and Çg = 0.93, or those obtained from the manufacturer (Zlokarnik 1979). Et provides information about the total energy needed for the aeration of real wastewater with a given system at the effective conditions. and we have to measure in clean water. Fig. 5.7 Standardized oxygen transfer rate, power consumption and efficiency of a Simplex aerator (Schuchardt 2005, data from Zlokarnic 1979). In reality c' = 1-4 mg L-1 and Et is 10 to 40% lower for e.g. 15 °C water temperature (Eq. 5.45 and Table 5.1). We must not forget that these measurements were carried out in a very small test unit of only 100 L. It is not permissible to transfer these results to a larger tank with a larger aerator without further intermediate studies. The question should be: can we use these results for a large-scale plant with the same type of aerator if we take the theory of similarity into account? We will return to this question in Section 5.5.